Here in New York City, it’s widely known that we have access to some of the freshest, cleanest, and best-tasting tap water in the country. So why do so many New Yorkers insist on purchasing disposable plastic water bottles by the truckload? At least one clean water advocacy organization is working to make it possible for NYC citizens to bottle their own water. Riverkeeper is a member-supported watchdog organization dedicated to defending the Hudson River and its tributaries to protect the drinking water supply of nine million New York City and Hudson Valley residents. 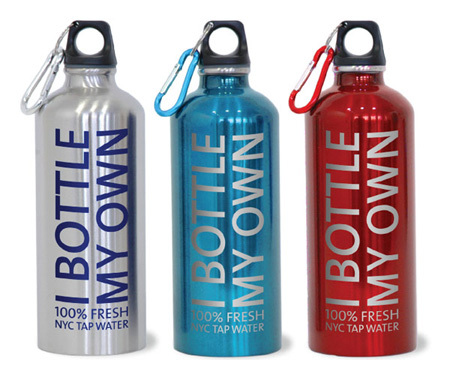 To encourage New Yorkers to break their bad bottle water habits, Riverkeeper sells customized stainless steel water bottles imprinted with the slogan “I Bottle My Own. 100% Fresh NYC Tap Water.” The custom eco-friendly water bottles sell for $20, which seems steep until you consider the fact that they’ll quickly pay for themselves. And of course, the profits from the promotional water bottles fund the continued efforts of the Riverkeeper organization. Do you have a cause you are trying to raise money or awareness for? Promotional products are great fundraising and brand awareness items. Contact ePromos to see how they can help your company!